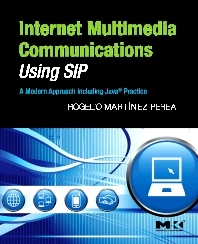 The book explains, in tutorial fashion, the underlying technologies that enable real-time IP multimedia communication services in the Internet (voice, video, presence, instant messaging, online picture sharing, white-boarding, etc). Focus is on session initiation protocol (SIP) but also covers session description protocol (SDP), Real-time transport protocol (RTP), and message session relay protocol (MSRP). In addition, it will also touch on other application-related protocols and refer to the latest research work in IETF and 3GPP about these topics. (3GPP stands for "third-generation partnership project" which is a collaboration agreement between ETSI (Europe), ARIB/TTC (Japan), CCSA (China), ATIS (North America) and TTA (South Korea).) The book includes discussion of leading edge theory (which is key to really understanding the technology) accompanied by Java examples that illustrate the theoretical concepts. For advanced readers, the book also explains how to build a SIP proxy and a SIP registrar to enhance one's expertise and marketability in this fast moving area. Network architects, network designers, network engineers, network service developers, service layer architects, and IT and telecom professionals working at mobile & fixed IP service operators, network equipment providers, network software vendors, etc., working at companies such as Juniper, Cisco, Telcordia, Deutch Telecom, BT, ATT, who want to obtain a thorough understanding of SIP-related technologies in order to design IP multimedia communications solutions.